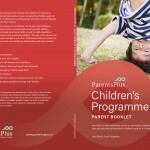 Parents Plus Children’s Programme – Parents Plus! An evidence-based parenting course promoting confidence, learning and positive behaviour in children aged 6 to 11 years. Targeting the needs of primary school children, the Parents Plus Children’s Programme shows parents how to communicate positively with children by illustrating ways to encourage good social skills as well as well-researched methods to tackle behaviour problems. The aims of the course are to help parents not only solve discipline and other childhood problems, but also for parents to develop closer and more satisfying relationships with their children. 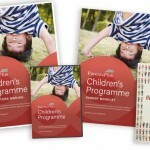 Two DVDs which contain 2.5 hours of footage containing over 80 real and role-played scenes of family interactions, which are backed up by comments from professionals, parents and children. A comprehensive Facilitator’s Manual that contains the full text of the DVDs, extensive background information, a full guide on how to prepare and run each session of the course including suggestions on how to structure group discussion and use role-play. 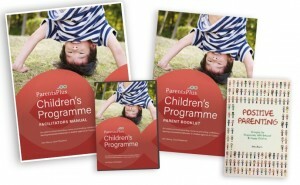 Two parents booklets that contain all the handouts and worksheets for participants. The package also comes with an accompanying parents’ book ‘Positive Parenting‘ which contains extra chapters on tackling common childhood problems (Authors: John Sharry and Carol Fitzpatrick). In running subsequent courses, additional parent booklets can be purchased at cost price by trained facilitators. Trained facilitators are also licensed to copy additional worksheets and handouts from parent booklets as needed. The Parents Plus Children’s Programme is evidence-based and several studies attest to its effectiveness in clinical, preventative and community settings. To evaluate the Parents Plus Children’s Programme (PPCP) a sequential block design was used to assign 74 parents of children referred to a CAMHS service to the PPCP group (n = 42) or the ‘treatment as usual’ (TAU) comparison group (n = 32). Assessment took place before and again immediately after the eight-week intervention for both groups, and there was also a five-month follow-up for the PPCP group. In comparison to the TAU group, significant reductions in children’s total difficulties and conduct problems, as measured by the Strengths and Difficulties Questionnaire, decreased parental stress and increased parental confidence were observed in the PPCP group. There were also significant improvements in parent-defined problems and goals among participants of the PPCP group. These positive changes were maintained at five-month follow-up, and further significant improvements in children’s peer problems and prosocial behaviour were observed in the PPCP group at five-month follow-up also. The findings also suggested that PPCP is more effective for parents of children with behaviour problems only, than it is for those whose children have behaviour problems and associated developmental difficulties. The full study was published in Clinical Child Psychology and Psychiatry (Coughlin, Sharry, Fitzpatrick, Guerin & Drumm, 2009). The Parents Plus Children’s Programme was delivered as an intervention for parents of children with mild intellectual disabilities in a special school setting and evaluated as part of a small Randomised Control Trial. A significant reduction in clinical range scores for treatment group participants (n = 16) was observed. Conversely, clinical range scores for waiting list control group participants (n = 13) increased, or remained elevated. The full study was published in Clinical Child Psychology and Psychiatry (Hand, Ní Raghallaigh, Cuppage, Coyle & Sharry, 2012). The Parents Plus Children’s Programme was evaluated using a RCT design as part of a national delivery by frontline staff in primary schools throughout Ireland. Participating parents with children aged 6 to 11 were randomly assigned to a treatment group (n = 44) or a no-treatment control group (n = 31). The efficacy of training was assessed using self-report questionnaires completed by participants in both treatment and control groups. Significant improvements were recorded on measures of parenting-related stress, child problem behaviour and parent satisfaction with medium to large effect sizes for the treatment group post-intervention, and results were maintained at 6-month follow-up. The findings support the efficacy of the PPCP as a community-led intervention with potential to prevent and interrupt child behaviour problems through supported parenting practice before problems become critical and entrenched. The study was published in the International Journal of Clinical and Health Psychology (Hand, McDonnell, Honari & Sharry, 2013). In November 2016, the Parents Plus Children’s Programme (PPCP) was updated and fourth editions of the Facilitator Manual and Parent Booklet were published. If you are using an older edition of the PPCP Facilitator Manual with the fourth edition of the Parent Booklet, please note the changes outlined in this document here.